(CNN) -- English football chiefs have refused to become involved in a slanging match with Johan Cruyff after the Dutch legend launched a stinging attack over Premier League transfer dealings ahead of next week's Champions League final. Former Barcelona coach and player Cruyff has used the Champions League climax to attack English clubs. The former Barcelona player and coach accused clubs -- including European title holders Manchester United -- on guardian.co.uk of damaging football by stockpiling players from around the world. Cruyff backs FIFA chief Sepp Blatter's calls for a cap on foreign stars with a 6+5 rule and controversially suggests that a change of law would "stop the trafficking of children" living in poor countries and identified as possible superstars of tomorrow. He holds up Barcelona -- United's opponents in the May 27 Rome final -- as a shining example of the way clubs should be run. Cruyff, who acts an adviser to the Barca president, Joan Laporta told the Web site: "Barcelona have a lot of home-grown players in the team. Big teams are not obliged to win at all costs; they are obliged to compete to win, always thinking of the good of the game." United beat Chelsea on penalties in last year's Champions climax in Moscow and it appeared there was going to be a re-match until Barca scored at Chelsea deep into time added on in a semifinal memorable for some contentious refereeing decisions. 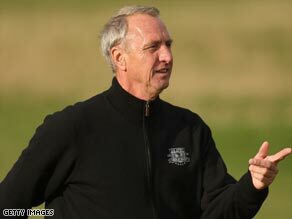 "However much English teams reach finals, I'm sorry, I do not buy it because of the players they have on the pitch," said Cruyff. "The vast majority of them have been bought from abroad. There are very, very few Englishmen. Just look at the Chelsea, Arsenal, Liverpool and Manchester United squads. "Both the English national team and football in general suffers as a result of them signing so many foreign players. Doing so weakens the competition because it's impossible for every player they sign to play. "I would like to see a candidate [at the European parliament elections] pick up on the 6+5 idea and fight to change the law on this. That way, the national teams would be improved. "As a consequence, you'd also stop the trafficking of children -- thousands of footballing hopefuls that are taken from poor countries and of whom only a tiny proportion make it. Where are the rest of them now, what's their life like?" English Football Associastion and Premier League officials answer Cruyff by pointing to statistics in the public domain. They show the World Cup-bound England national team is enjoying one of its more consistently successful periods on and off the pitch. Also that 200 players in the Premier League are England qualified. Reflecting the need to encourage the development of local talent and to be confident that the future supply of England-qualified players is at least as good as at present, clubs have already indicated in principle support for a Home Grown Player quota to be applied to Premier League matches. When it comes to Premier League Academies, 85 percent of 16-18 year olds are British -- with freedom of movement around Europe from the age of 16. As for the Champions League, six of United's triumphant team last season were English while the last time Barca won, in 2006, they could count only three Spaniards.